Welcome to my blog - where you can take a look behind the scenes on some of my big (and small) adventures. Enjoy! After a quick stop to pick up a six pack of Kona IPA, we head straight to the beach. When we go swimming, I try to take in everything around me: revitalizing salt water. Abundant sunshine. Picturesque views. But most of all, I feel immensely grateful to have this quality time with one of my best friends. In honor of International Women’s Day, I want to share stories of women who have been (and continue to be) massive sources of inspiration and motivation for me. They are mountaineers, marathon swimmers, scuba divers, and polar explorers. They are leaders. They are survivors. And they are brilliant authors. This list below includes works of non-fiction written in first-person by women who seek adventure, discovery, and scientific endeavors in domains many consider “traditionally male-dominated.” Scrolling through the titles, you may notice recurring themes and subjects — pursuits in the alpine world, epic endeavors in the ocean, and expeditions around the world, from Antarctica to the Himalayas to the outback of Australia. Standing in the doorway of Robert’s house in downtown Harrisonburg, I stare at monochromatic misting rain and gray skies. It’s a typical winter day in northern Virginia—wet, cold, and bleak. Snapping photos of Kate Gould as she finishes installing a coral table at a reef in Key Largo. After driving nearly 900 miles, stepping out of the car and into the warm evening air of southern Florida feels especially sweet. We have just arrived in Homestead, a small town located a few dozen miles north of the Florida Keys. Within five minutes, we pull bags and gear from the trunk, take a quick look around our AirBnB, then head straight to the back yard. While Kate strums a melody on her ukulele, I stretch and stare at the day’s final rays of sun peeking through giant palm leaves. It almost feels like a vacation. Almost. A year ago today, I quit my job at UNC to pursue being a full-time freelance photographer, videographer, and professional adventurer. Hope in a rope. A tree branch and few pieces of rope can become life-saving tools when dealing with a broken femur in the backcountry. Faced with the daunting task of handling life-threatening situations, the WFR protocol arms us with a set of systems. We learn how to check heart rate, respiration rate, and blood pressure. We learn how to evaluate a patient’s skin, and pupils, and level of consciousness. We learn these six measures are our vital signs. We cover topic after topic: Sprains. Strains. Fractures. Seizure. Stoke. Heart attack. Shock. Today is December 31st. In just a few hours, the righteous, volatile, and life-changing year that has been 2018 will come to an end. In an attempt to make sense of the past 365 days, I am adding up numbers. 128: the number of days I spent at home in Chapel Hill/Durham. 237: the number of days I spent traveling. Four major road trips across 18 states in the U.S., a corner of Canada, and two regions of Japan equals roughly 12,000 miles traveled by car. 105 days of living and working at sea comes out to over 9,000 nautical miles traveled by ship. 16 flights equate to about 17,500 miles traveled by plane. Kim Collins, Pat Hull, and Scott Collins pose for a photo in a bamboo forest in Kyoto, Japan. After spending two months at sea this summer, one of my colleagues from the ship told me her buddy was planning to bring a group of American musicians to Japan for the first time. She suggested I reach out to him about documenting the tour. A couple e-mails, two phone calls, and one very long plane ride later, I find myself in Japan, meeting Gus Bennett for the first time, along with with singer-songwriter Pat Hull and folk rock duo The Smoking Flowers. I have landed in a strange, foreign place, but I quickly come to find I am among friends. 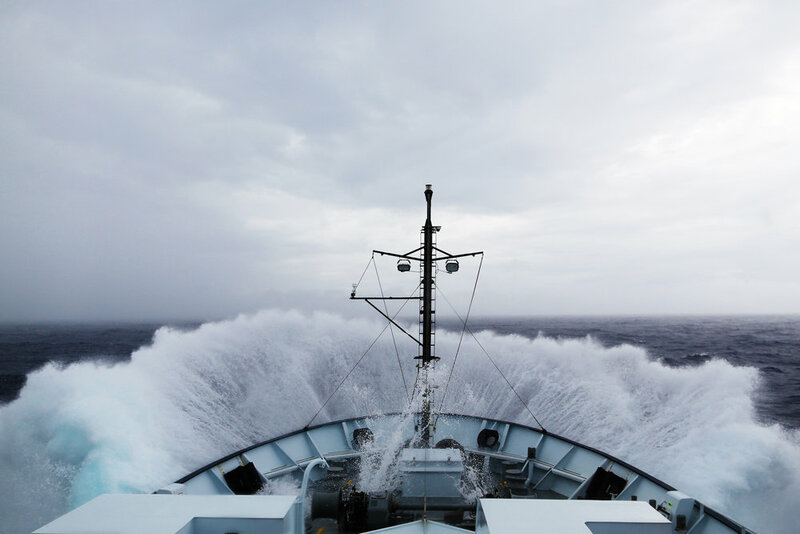 Navigating through rough seas in the Eastern Tropical Pacific during hurricane season. Before 2018, I had never spent more than two days on a boat in the open ocean. 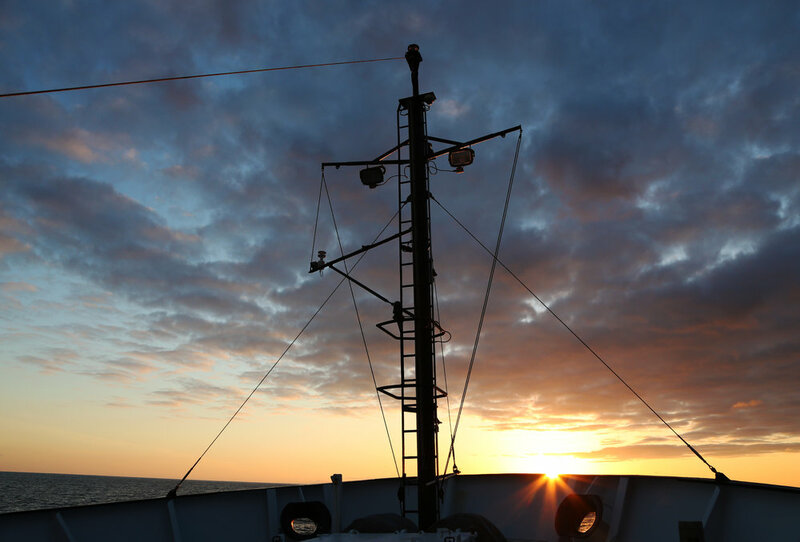 In the past nine months, I have joined four different major research expeditions, culminating in over 100 days spent living and working at sea. Below are just a few moments (and people) that stand out in my mind. On the summit of Trapper Peak just after 6am on August 1, 2018. In just a few hours, we’ll cross another state border, and I’ll savor the joy of seeing yet another rugged, beautiful place that I’ve never visited before. While I still have signal, I Google some quick facts about Montana. 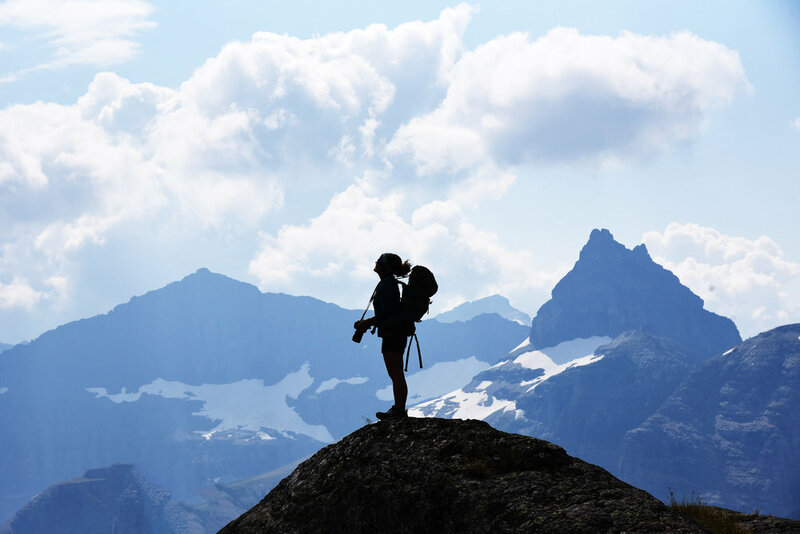 Montana comes from the Spanish word Montaña which in turn comes from the Latin word Montanea, meaning "mountain", or more broadly, "mountainous country". Montaña del Norte was the name given by early Spanish explorers to the entire mountainous region of the west. This is my favorite thing. This is my favorite thing. As the midday sun beats down on us, and the muscles in my legs strain against the rocky incline, I repeat this phrase silently to myself, over and over again. I'm climbing up a giant volcano. This is my favorite thing. This is my favorite thing! Cruising towards the eastern Sierra Nevada mountains in central California. As the bartender places the beers on the counter, I tell her today is the first day of an epic road trip. "No way!" she says. "That is so cool. Where are you guys headed?" We give her a quick overview of our itinerary—drive from here (San Diego) straight to northern California, then into southern Oregon, across Idaho into Montana and Canada, then down into Wyoming, Utah, and eventually end up in New Mexico. She stares at us, with her mouth open. "I'm so jealous! That sounds amazing!" 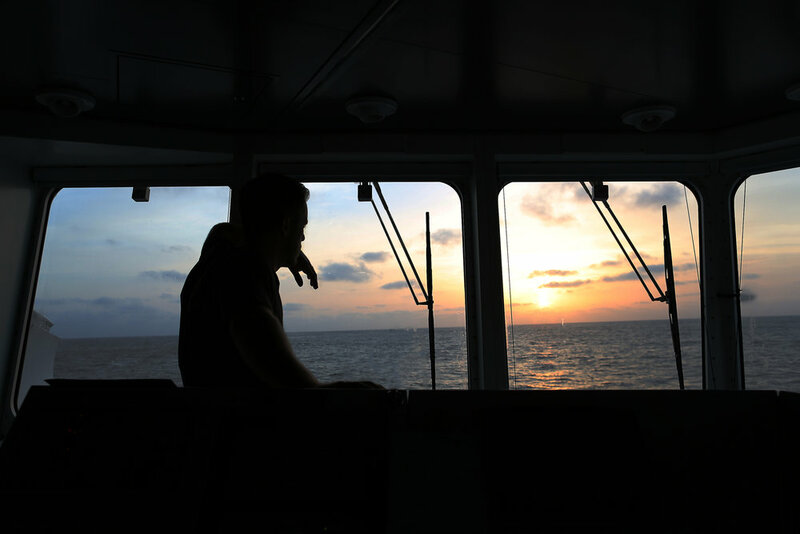 Chief Officer Jason Garwood watches the sunrise from the bridge of R/V Falkor. When Chief Officer Jason Garwood hands me a mug of tea, I accept it gratefully and gently blow on the emanating steam. The force of my breath forms tiny ripples across the small circle of hot liquid. Outside, the early morning breeze generates the same effect, creating steady, rhythmic waves across the surface of the northeastern tropical Pacific. Right now we are roughly 215 miles off the coast of southern Mexico. As we lower down and splash into the rolling water, I feel a child-like sense of joy. This is fun! Especially today—the sunshine is righteous. When I went out in this boat three days ago, I wore my fleece and soft shell jacket. Now, after so many cool gray days, it finally feels like summer. We zoom away from the ship and I relish the sensation of hard wind in my face and the sight of sunlight twinkling on the water's surface. Nomad life: preparing to pack everything I'll need for three months of traveling this summer. I’m exhausted. Hauling boxes and bags is fine, but the mental fortitude required to go through everything I’ve ever owned necessitates a different kind of strength. Austin and I take in the epic view from my favorite spot on the Woody Ridge Trail. "Today is Sibling Day!" I shake my head in disbelief. "We forgot again!" Austin and I are closer than most siblings I know, but we almost always forget to mark "Sibling Day" on our calendars. More often than not, we happen to be together on April 10th, doing something awesome. I didn't take a photo at that moment, but if I had, it would have captured the identical grins on our faces. Lounging in my happy place. Throughout our time in Antarctica, I never felt homesick. I never wished I wasn’t there. But I did spend a few nights tossing and turning—either from the lurching of the ship or the turbulence of my own mind. In those moments, as I squirmed around in the small bunk, I allowed my thoughts to drift to my "happy place"—not my bed, not my house in Chapel Hill—but my little orange tent, the Creamsicle. Now, as I pull my sleeping bag up to my face and breathe in the cold, crisp mountain air, I can't believe I'm finally here. I stop by Zee's office, give her a huge hug, and tell her I'm working on some plans. I don't know exactly how or when, but I know— in my mind, in my heart, in my gut — I'm coming back here. "Marley, it's been such a pleasure meeting you," Zee says warmly. "You know what you have to do now, right?" She looks at me intently, taking in my boundless energy and eagerness. "Keep it alive," she says. "I know you'll be back down here. Just keep it alive." Eric Hutt and Amy Westman smile from the Hadar boat near Palmer Station. "This place works almost as a natural selection for people that have this intention to jump off the margin of the map, and we all meet here – where all the lines of the map converge. I think a fair amount of the population here are full-time travelers and part time workers. They are the professional dreamers." 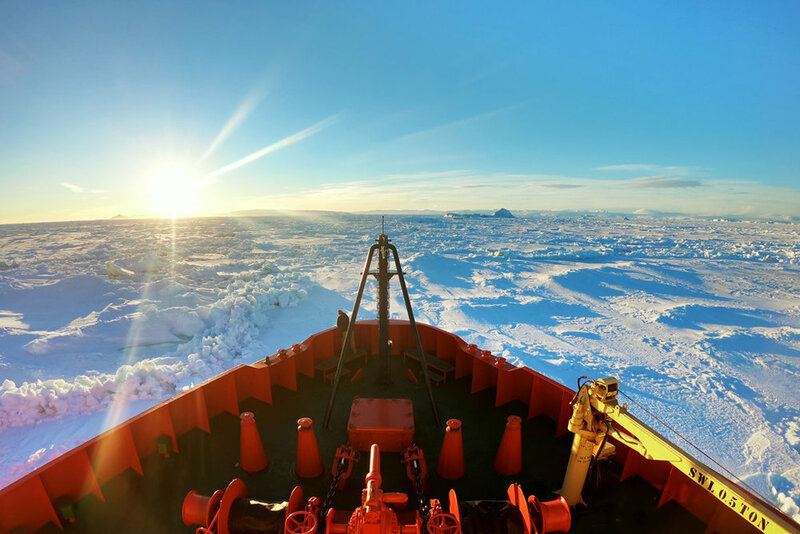 The sun sets over the bow of the Laurence M. Gould, as we make our way across the frozen Weddell Sea. Widely regarded by scientists as one of the iciest places on the planet, the Weddell Sea is perhaps best known for trapping Ernest Shackleton’s ship, the Endurance, in 1914. When I read Alfred Lansing's book about that doomed expedition, and the incredible fight for survival that followed, I loved the gripping descriptions and vivid details. But I have an entirely newfound appreciation for that epic story now. No wonder they got stuck here.